The Lights command opens the Lights panel. The lighting object names. Double-click a lighting item in the panel to access more settings in the Properties or Sun panels. Provides an overall lighting effect. Provides a strong, directional lighting effect depending on the settings in the Sun panel. Turn on the lights with the checkbox checked, all other lights will be turned off. Clearing all checkboxes turns on all lights. The brightness of the light. The layer a light exists. Click to select a light type and pick points in the viewport to place the light. Displays the lights in the list when their layers are turned off. Selecting a light in the list also selects the light in viewports. Displays light groups in the list. Turns the selected lights on or off. Deletes the selected lights. Sun and Skylight cannot be deleted. Edits the selected light in the Properties panel. Unchecks all Isolate checkboxes to turn on all lights. Ungroups the lights in the selected group. Sets the color of the light. Setting the color to shades of gray dims the light. Controls the brightness of the light. Controls the darkness of the shadow cast by the light. Controls the blurriness of the light spot edge. The DirectionalLight command inserts a light that simulates the sun defined with parallel rays and a direction. Location point (1), dolly point (2), target point (3). Pick a location at which to aim the directional light. Pick a location for the directional light. A directional light shines toward a specified direction. The location of the light does not matter: the light object merely indicates the direction the light shines. Turn on the light's control points and move or drag the control points to edit the light's direction and target. 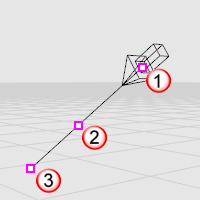 To move the light without changing its direction, move the dolly point (the control point at the midpoint on the direction vector). The LinearLight command inserts a light that imitates a fluorescent tube. Pick the start of the light. Pick the end of the light. The PointLight command inserts a light object that emits light from a single location in all directions (omni light). The RectangularLight command inserts a rectangular light object that emits light from an array of light points in one direction. 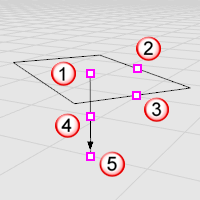 Location point (1), length control (2), width control (3), dolly point (4), target point (5). Turn on the light's control points and move or drag the control points to edit the light's direction, length, width, and target. Pick the light's start point. Pick a the light's length. Aims the light at the specified location. 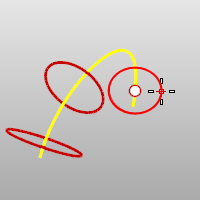 The Spotlight command inserts a light object into the model that directs a narrow beam of light with falloff. The spotlight object appears as a cone shape. Its light appears only in full renderings of the targeted objects. Use the Properties command to set the light's color and on or off state. Darker colors, like gray, light the scene less. 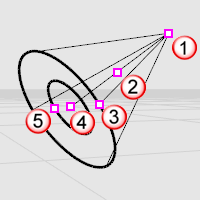 Location point (1), dolly point (2), radius control (3), target point (4), hotspot control (5). Pick the center and radius of the base circle. 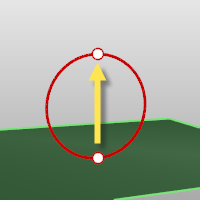 The second point can be placed anywhere using elevator mode, object snaps or other modeling aids. Turn on the spotlight's control points and move or drag the control points to edit the spotlight's direction, length, beam angle, hotspot angle, and position. To move the light without changing its direction, move the dolly point (the control point at the midpoint between the cone tip and the center of the cone base). Spotlights with narrower cones produce more detail than spotlights with wider cones. The cone for the spotlight represents the direction of the light, not the range of the light. The brightness of the light from the spotlight remains constant, even as you move away from the tip of the cone. The length and width of the spotlight together do control the shape of the infinite cone in space that is illuminated by the spotlight. Objects near the center axis line of the cone are illuminated the most brightly. That bright full illumination continues for half of the width of the cone, and then slowly drops off to nothing at the very outside of the cone. Spotlight hardness controls the fully illuminated region. You can either shrink it or expand it so that there is no drop-off at all. The easiest way to see what this does it is to create a plane with a single spotlight shining on it, and then play with the spotlight hardness parameter to see what it does.